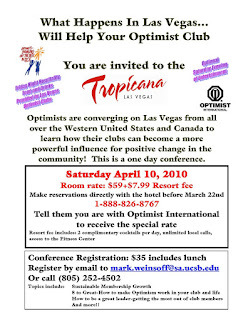 Mark Weinsoff, Vice President, West Region, Optimist International is encouraging all members, not just club and district leaders, to attend the regional motivational seminar for Optimist Clubs and Districts on April 10. It will be held in Las Vegas, NV. See the flyer and registration information here. Please be sure to leave a comment here if you or someone from your club is attending. Thanks! NOW is the time for new members to join your Optimist Club! How do I know? Because two of our PNW Optimist Clubs have held very successful NOW events this month. The Pasco-Tri-Cities Optimist Club added 11 new members. Not to be outdone, the Mason County Optimist Club added 12 new members. Tonight, the N. Kitsap County Optimist Club will try toadd to their membership with an impromptu NOW reception. Good luck! Experience Optimism: Celebration, fundraiser or both? Congratulations to the Abbotsford Optimist Club for receiving a matching Childhood Cancer Campaign grant. The OIFC will match the $3,000 raised by the club at their 25th Anniversary party for the Cancer Foundation of British Columbia. Click on the link for more information. Experience Optimism: Celebration, fundraiser or both? District Oratorical Chair Ray Hilts has announced the dates of the regional competitions for the PNW District. The Regions were set by the District Oratorical Chair based on the number of clubs participating as of this post. Not all zones have participants. For example, in Region 4, only Zones 7 & 10 are sending contestants, but should other clubs decide to have contests their top two contestants would compete in the designated region. The dates were set in coordination with the lt. governor in the community where the competition is being held. We will update this post when more information becomes available. There is still time for every Optimist Club to hold a club level contest. We guarantee that your club winners will have the opportunity to advance to a zone or regional contest, even if it is not geographically correct, up until the last regional competition is held. The Optimist Oratorical Contest has been held annually by Optimist Clubs since 1928. Children up to age 16 prepare and deliver a 4 to 5 minute speech on a single topic and compete for college scholarships. The topic this year is "Cyber Communication: Progress or Problem?" More than $250,000 in college scholarships will be given away by Optimist Clubs, Districts and Optimist International this year. The club is also hoping to have another Bike Safety Fair on June 26 at another location. Bruce wrote, "So as you can see it’ll be a busy June 2010 for our club. Last year we had more than 1,100 people in attendance to our (2) day event, serving over 350 kids. So providing helmets for that many kids, and teaching them safety rules of the road, we saved over 350 lives. It’s a good feeling to know that you’re making a difference. We’re also still serving the local food-bank the third Tuesday of every month from 5p-7pm." Thanks for the update Bruce! We love hearing what is happening in your community. Yes, you are making a difference. You can find out more about the Issaquah Optimist Club's Bike Safety Fairs by contacting Bruce at 425-653-1089. Mark Weinsoff, Vice President, Optimist International West Region is planning a one-day motivational session for Optimist Club leaders and members. The event will be held in Las, Vegas, NV on April 10. Please click on the picture for full details. Regional gatherings allow Optimist Club members to meet and network with others outside their own district so they can share ideas, projects and enthusiasm. If you decide to go, please be sure to let the PNW District know that you are attending. Send an email or leave a comment below. Thanks! 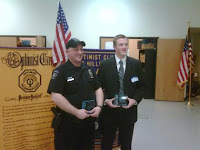 The Hillsboro Optimist Club held their annual Respect For Law Awards on March 9, 2010 at the Hillsboro Senior Center. This award honors local police for their dedication to and advocacy for youth. Brandon Peck, an Hillsboro Police Department records specialist was recognized for his off duty coaching and mentoring of youth, and for leading by example. Officer Kevin Harrison, a Hillsboro police officer. Kevin was also recognized for coaching and mentoring kids with the Hillsboro Soccer Club. Meet Tania Richards (L), & Jen Popp, two brand new Optimist Club members. They are shown here with President Lori Felix as they are being inducted into the Sandy Optimist Club. We would love to help you welcome your new members! Send us a picture and we'll introduce them to the PNW District Optimist family. Check out the enthusiasm of our new PNW District Optimist family members! The Eagle Optimist Club held their Charter Banquet on March 4 and Optimist Clubs from the Boise Valley were there to show their support. Sponsoring club Meridian gave the new club an Optimist Creed banner and American flag. Co-sponsoring club Jerome will be providing official name badges and they also presented each charter member with one of International President Mark Shriver's theme pin with the eagle logo. Governor Linda Jackson and Director of Growth Rocky Jackson presented the official banner, bell and gavel to co-presidents Gretchen Brown and Mike Harris. Secretary/Treasurer Randy Rabehl was entrusted with the official charter from Optimist International. Past International Vice President Bud Aune presented the new club with an honors/awards banner and challenged them to strive for the best. 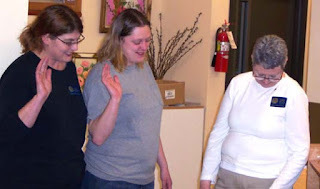 Governor Linda welcomed the new club and also asked the clubs present - Boise Noon, Caldwell, Eagle, Jerome, and Meridian - to work together and to nurture each other so they might all come together in 5/10/20 years to celebrate even more Optimist Clubs in Idaho. Governor Linda Jackson and Lt. 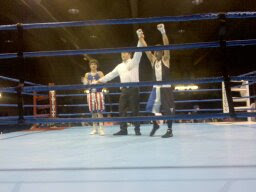 Governor Sue Thompson were invited to the Caldwell Optimist Club Silver Belt Invitational Boxing Championships on February 27, 2010. Together with their spouses they were treated like VIPs and even participated in presenting awards to the boxers who competed in weight classes 70 lbs. to 185 lbs. Yes, she's been serving as the Membership Recruitment Chair this year, but effective March 1, Adele Heinrich has returned to the post of District Secretary/Treasurer. If you are in the process of paying your district dues, please forward your payments to Adele. If you have already mailed them, no worries, everything will get posted to the right account. Thank you for your attention to this change. Here in the Pacific Northwest we have always believed that March is for Members. This is the month we hold NOW activities and really promote how wonderful it is to be a part of an Optimist Club. This year, Optimist International has sweetened the deal for individual members. 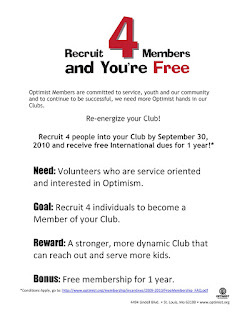 The new incentive program asks you to recruit 4 new members and the amount that your Optimist Club would pay to Optimist International for your membership will be waived for one year. That's a nice treat for sharing the joy of service with others. Find out all about the special offer here or click on the picture to enlarge and print. Questions? Check out the FAQs from Optimist International.